ADS won Favorite Charter School again in 2018! ADS proudly received the 18th Endangered Species Mural Project mural from the Center for Biological Diversity and artist Roger Peet. This beautiful addition to our campus highlights the increasing risk to several local salamander populations. EcoWellness is an Essential class for all students that they attend once per week. Here, children will learn environmental stewardship, gardening skills, science, and how to care for creatures we share this land with. Education in nature is a tenant of our philosophy at Austin Discovery School. Every class hikes at least once a week in the vast wooded area between our campus and the Colorado River. These hikes provide opportunities for lessons in science, ecology, nature, as well as invaluable social and community-building opportunities for students and staff. Being grounded in nature lets us all grow as students and aides in our emotional health. ADS Students performing during our annual "Fall Into The Arts Festival"
Austin Discovery School has an amazing pollinator garden established by elementary students. We have a local population of bees and butterflies to help the land, health of the planet, and to teach about the symbiotic nature of life on earth. ADS has an amazing food forest located in the large gardens as a part of the EcoWellness program. Cilantro Boombox rockin' Austin Discovery School's "Fall into the Arts" Festival! 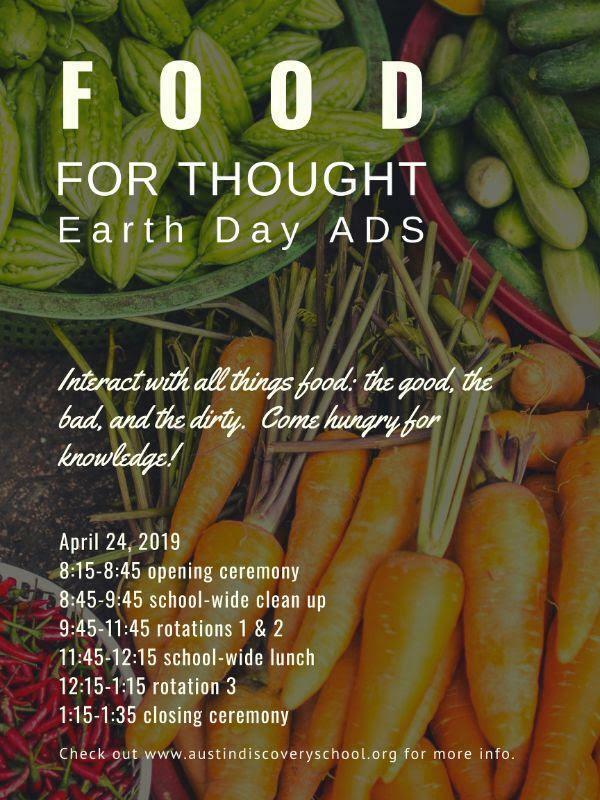 ADS' Earth Day Celebration will be April 24. Activities will be happening all over campus that day and you are welcome to attend - check with your classroom teacher for more specifics! ADS Exhibition Week is 4/22-4/25! ADS' First Annual Exhibition Week is Fast Approaching. Mark Your Calendars! This year ADS will replace our annual end-of-year SPARK celebration with Exhibition Week. 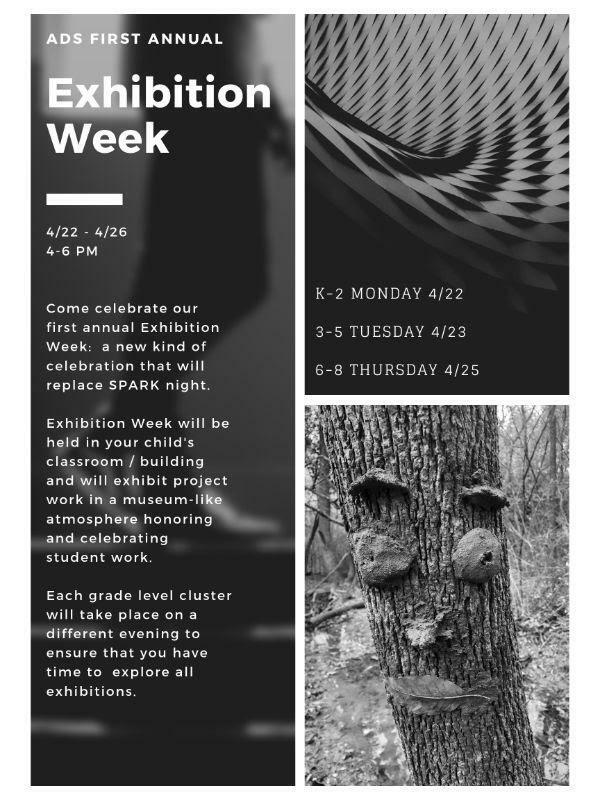 ADS is revamping how projects and classwork are shared; next year there will be a Fall Exhibition Week in conjunction with Fall Into the Arts as well as a Spring Exhibition Week April 22-26 in conjunction with the Earth Day celebration. 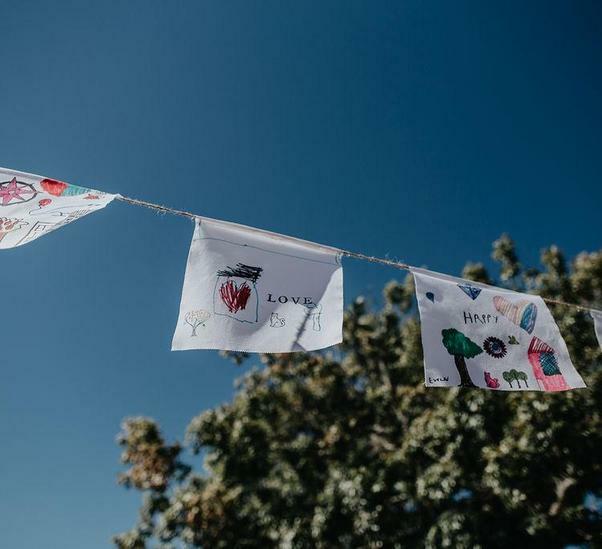 This will give families two opportunities to come on campus and see all the amazing work happening, as well as create more community by interacting with other families. The Exhibition Night for K-2nd grades will be Monday from 4-6 pm, 3rd-5th grades on Tuesday 4-6 pm, and 6th-8th grades on Thursday 4-6 pm. Please feel free to come to multiple days and tour all the classrooms in all the buildings to see the cool things happening! ADS is seeking Board Members! ADS has received the 18th installment of the National Endangered Species Mural Project! 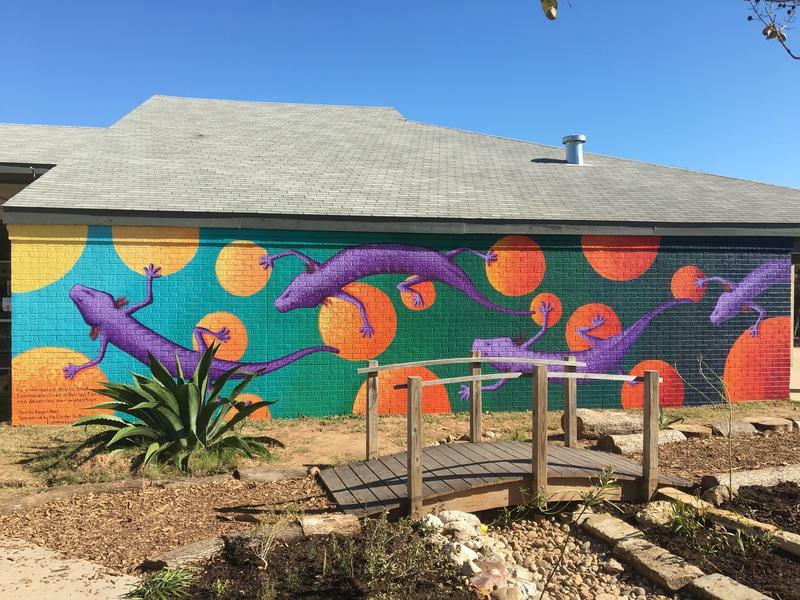 The Center for Biological Diversity funds a world-class muralist, Roger Peet, to paint fabulous murals to highlight specific endangered species to raise awareness. We are celebrating the Austin Blind and Jollyville Plateau Salamanders! ADS won Favorite Charter School 2018! 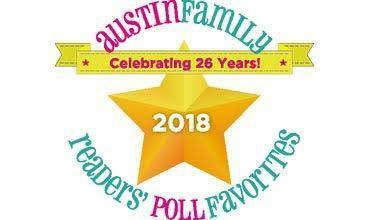 We're so proud to win "Austin Family Magazine" Reader's Poll again in 2018! Thank you to the community for believing in us and spreading the word of the community you love! Austin Discovery School creates socially and emotionally aware, confident, critical thinkers and problem solvers through interactive, hands-on lessons and relevant project-based learning. ADS serves children within our geographic boundaries, grades K-7th. Public Charter Schools are free of charge. To apply, please visit the enrollment section of the website. ADS is a 501(c) non-profit institution. We rely on community support and generous donations to supplement the core academic program funded by state and federal funds. There are many ways to support our innovative educational program.